I bought a Nexus 5 32GB the day it was announced. I've had it for a little over one week now, and I really like it. Great as the HD2 is, today's software seems to want more CPU and RAM to work well. No matter how much tweaking I do to the HD2, it still seems underpowered. The Nexus 5 has enough horsepower that I think it will last for a while, hopefully as long as the HD2 has. The first thing I did on getting the new device was to root it. I used ChainFire's root method from XDA and it worked the first time. NYLimited is right about the SIM. The N5 uses a micro SIM. I got mine for free from a T-Mobile store. Good luck with the new device. Yes, as you said, today's software wants more CPU and RAM to work well. I can't wait to get my Nexus 5 and root it. Why HTC One? Do you want to use WP8 and Android? As for me, I would like to use HD2 until it is broken. I bought it almost at launch and it was very expensive. soren wrote: As for me, I would like to use HD2 until it is broken. I bought it almost at launch and it was very expensive. Yes, same here. I used the HD2 till the screen stopped responding (digitizer problem) at which point I decided it was too old to try and keep it going. Still have it sitting in the drawer for some odd reason. soren wrote: Why HTC One? Do you want to use WP8 and Android? As for me, I would like to use HD2 until it is broken. I bought it almost at launch and it was very expensive. I am using two phones (I have 2 sim cards too); a HTC Leo and a Nokia E90. When I will buy One, I will use One and Leo. I am boring from Leo. No active development on bootloaders, radio roms and other dark-side things etc... For example I didnt find teammates for bringing rmnet to LK. Since I killed my HD2 I've tried a dozen ROMs for my Amaze. Unfortunately the only ones which are fully functional and stable are based on the last officially released HTC ICS-4.0.3 for T-Mobile. All of the newer ones are either buggy or with a broken feature I need to have working to use as a daily driver. I was thinking about purchasing the rumored reissued Nexus 4 with true lte that's supposed to be released after the holidays, but after hearing of your nexus 5 purchase I'm reconsidering. I still think the 5 is a bit too large for my purposes, but with you getting one I know it will be well supported. It's a great phone I wish you much luck and enjoyment with it. Odysseus wrote: Since I killed my HD2 I've tried a dozen ROMs for my Amaze. Unfortunately the only ones which are fully functional and stable are based on the last officially released HTC ICS-4.0.3 for T-Mobile. All of the newer ones are either buggy or with a broken feature I need to have working to use as a daily driver. I would be hard pressed to argue with the N5 which is a really nice device, especially for the price. NYLimited wrote: Yes, same here. I used the HD2 till the screen stopped responding (digitizer problem) at which point I decided it was too old to try and keep it going. Still have it sitting in the drawer for some odd reason. I have 2 HD2's which are in darn good condition (mine is VG and my wife's is excellent), but thought it time to have a current generation phone, the LG G2 (D801). Now, I am finding myself a little bored as it works without tweaking... trade-offs, I guess. 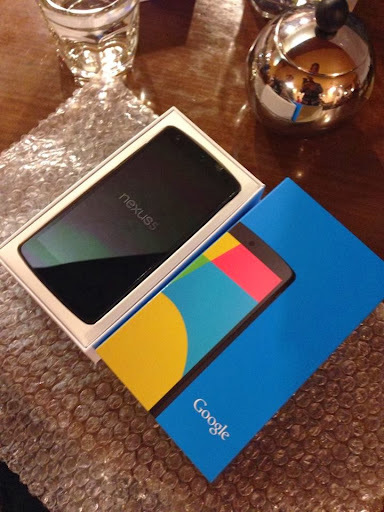 My Nexus 5 just arrived.